The Facts4workers solution provides the workers with all relevant information for the process and product monitoring and the support to improve the process performances. The company’s main customers are the automotive industries and their suppliers to which HIR delivers high precision components, like rotors for motors and alternators. The production line is characterized by high precision machines, like numerical controlled lathes, and automatic measuring devices. This allows HIR to achieve and deliver high quality products, thanks to the possibility to adapt real-time the setup parameters of the production machines in order to cope with quality requirements of the products. This feedback loop between the measurements and the production is carried out by the operator, F4W want to include a decision support system to support this activity. The solution provide access to a repository of solutions for most of the production issues that arise during production. The developed system is directly connected to the PLC of the production line to obtain a clear and timely classification of the problem and suggest the optimal solution to the workers. Solutions are created using a bottom-up approach: the workers introduce the solutions in the system to support each other efforts and create a collaborative environment. The rating of the solutions and the possibility to add documentation (video, photos, text) to an existing solution enables the development of a continuously evolving solution environment that could support the workers. Process monitoring will allow the workers to have a continuous feedback about the status of the process and enable them to take improvement actions as soon as a deviation from the standard is found. The process monitoring is based on the direct connection of the F4W solution to the measuring devices that check 100% of the production coming from numerical controlled machines. This approach is able to “connect” the workers to the machines and enhance their consciousness about the process. 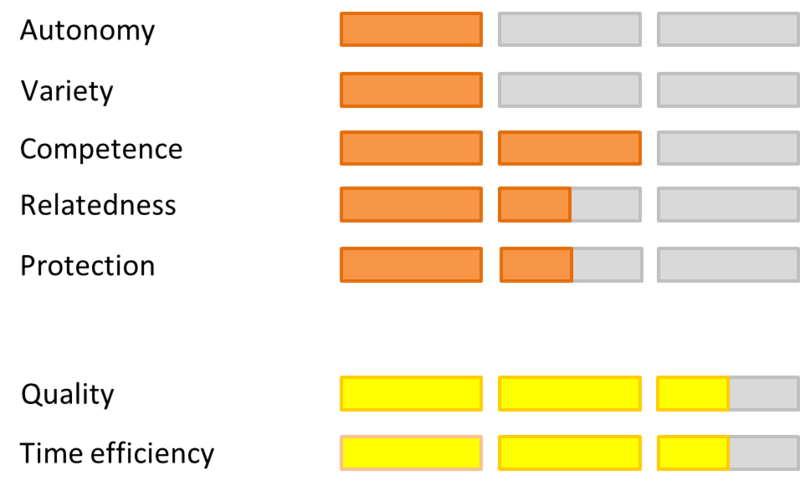 Data visualization allows the workers to access digital representation of the product blueprints. 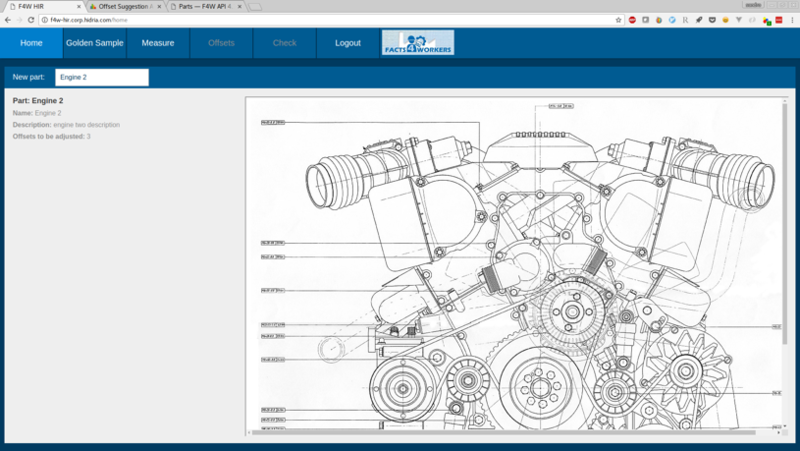 This functionality allows to have anytime the most updated drawing with possible comments from the production leader. The possibility to use a single repository to store all the data facilitate the access to information and reduce the time spent to look for proper information. The blueprint could be zoomed, moved, commented, etc. This approach reduces the pressure on the worker, providing him all the required information on the top of his fingertips. Janez starts his shift and as usual he talks to his colleague of the previous shift. After talking to him, he rearranges his workplace to his demands. A part of the badge is still left over from the previous shift and therefore Janez immediately starts running further parts. For this operation he has to press the shaft into the die-cast aluminium rotor before mounting them in the chuck of the CNC turning machine. This CNC lathe runs a predefined program and machines the part to its final dimensions. After machining, Janez takes the part out and carefully measures all relevant dimensional parameters. He knows the allowed tolerances from the CAD drawings and uses several measuring gauges in order to guarantee that the part is within its specification. Every part is measured. If a part fails it is either re-machined or thrown away if a rework is not possible. If that happens the reason has to be identified. Typically three sources of errors are considered. Either the raw material was not within its specification, there is a fault on the machine or the parameters of the CNC-program are incorrect. But as most of the time the part just measured is just fine so he continues producing parts. An hour later, the badge runs out. Janez knows that he now has to setup the machine to produce a different and bigger rotor. Bigger rotors tend to be heavier which means a greater physical strain on him moving around the part. The most important step now is to dial in the CNC program parameters to meet the target specification of the parts. Janez has to be very careful here, because when setting up the machine, wrong machine parameters could destroy the part and also damage the ma- chine itself. His aim is to correctly set the machine up while minimizing the waste. Wasting a lot of parts would put him in trouble because of the resulting bad workplace efficiency. Today’s setup procedure is unusually tedious and has already taken three hours. He struggles with a deviation of one dimension he just cannot compensate for reliably. Still the parts coming out are not within specification. He knows that one of his colleagues has faced this before. He has told him about the problem two weeks ago during the coffee break. But Janez does not know the solution and the colleague is not on duty right now. Janez is bugged out. Normally such a procedure runs within two hours. It is a complex system with many parameters such as the condition of the cutting knifes, fluids or the condition of raw material – all of which have to fall in place to ensure production quality. To compensate for these deviation Janez edits the CNC program variables again to carefully further approximate to the target dimensions. Finally after more than three hours the setup is completed and the badge can be produced. Janez starts his shift and as usual he talks to his colleague of the previous shift. A part of the last badge is still left over from the previous shift and therefore Janez immediately starts running further parts. 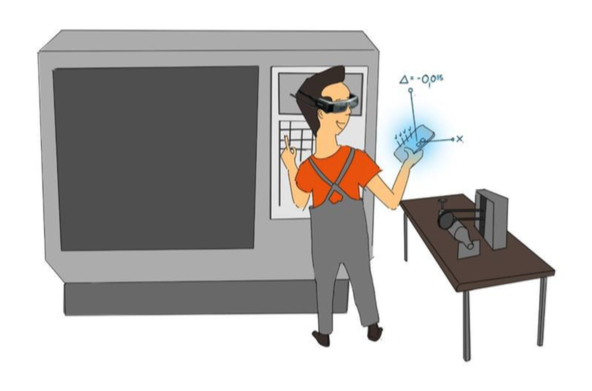 To monitor the production, Janez puts on his AR- Glasses. He also has a tablet version of the system at hand but he most often likes to have both hands free during his work. Therefore, apart from data entries made into the system he prefers using the glasses. Right away he sees, that system is telling him that everything runs very smoothly today and that he is perfectly within schedule. 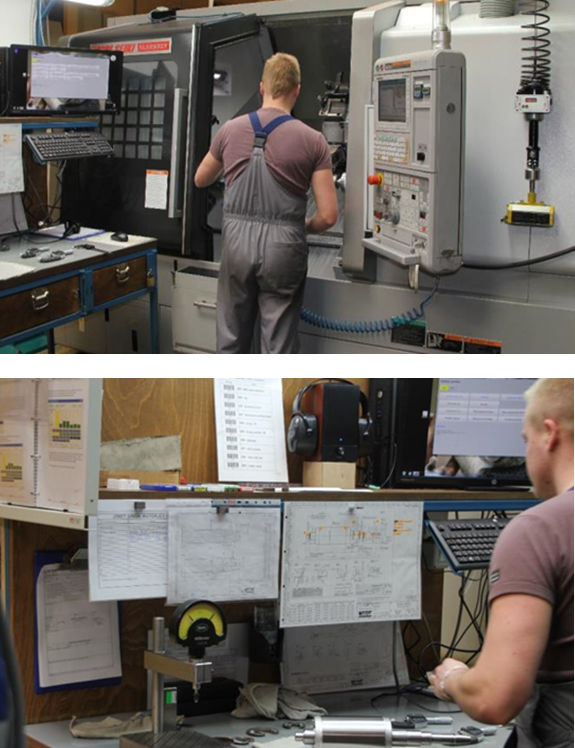 Janze places a new part into the CNC turning machine. After the program has finished, he takes the part out places it in an automated measuring rig. This rig can probe the relevant dimensions in a fully automated manner. 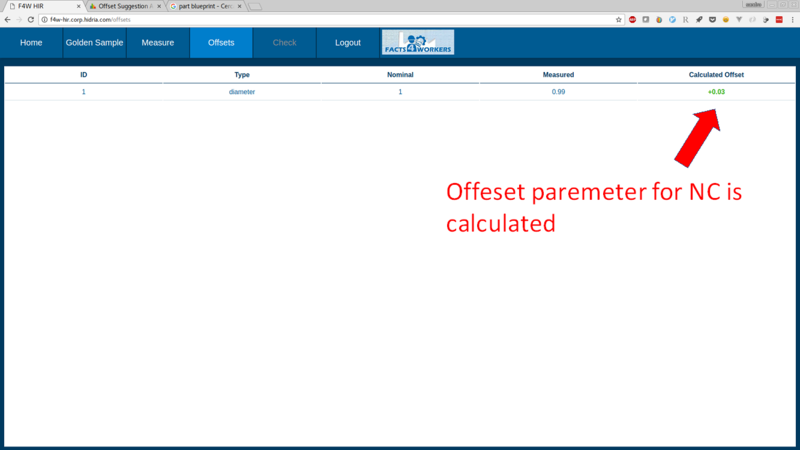 In contrast to the simple pass/fail quality control scheme applied before, the new system can record and track all dimensions as absolute values on a per part basis. The system automatically retrieves the dimensions and tolerances from the database and additionally provides the CAD drawings to Janez to guarantee that the part is within its specification. As before every part is measured but now Janez can save a lot of time as the tedious measurements are now fully automated. He uses the time to press the next shafts into the rotor blanks. A couple of minutes later Janez gets notified by a blinking symbol in his glasses that the last parts produced are slowly drifting towards the boundaries of the specification. 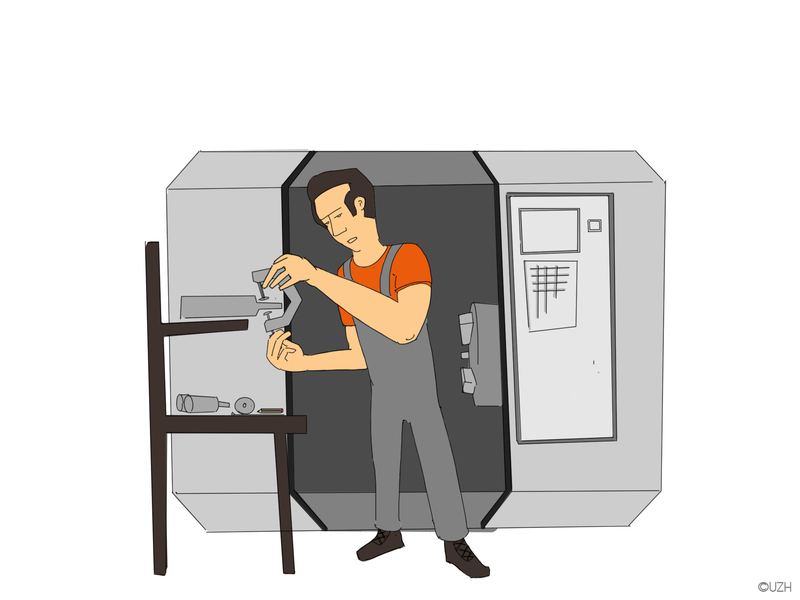 The system suggests to update a specific CNC parameter to compensate for tool wear. But that simple approach does not solve the problem. Janez remembers that he has talked to his colleague two weeks ago about a similar issue. He uses his tablet to look up the problem. Quickly he finds the report on what his colleague did. He follows the instruction, solves the problem and produces the rest of the badge without any further interruption. An hour later, the badge runs out. Janez knows that he now has to setup the machine to produce a different and bigger rotor. The most important step now is to dial in the CNC program parameters to meet the target specification of the parts. As he downloads the program, the system automatically displays suggested initial setup values. These values are conservative estimates on the first trial, as neither the machine nor the work piece shall be put in any danger. He tries these parameters out on a new blanked. As expected the target dimensions are not met with this first pass or parameterization. After placing the rotor into the measuring rig, the system assesses the different dimensional properties and calculates the next estimations for the parameters. Janez enters these parameters and runs the pro- gram on the same rotor again. After three cycles, all dimensions are met. He tries out the final program on a new blanked to verify that the target dimensions can be also achieved in only one machining pass. The whole procedure took Janez just about one hour. He is very happy as the new approach allows him to be more productive. Janez likes it a lot when he can contribute to the success of his company. Today he has overachieved his plan which makes him leave the company with a smile and he is looking to come to work tomorrow.